Priority Pass has had quite the year, despite growing at an increased pace with so many new travel credit cards adding the perk and losing a few lounges along the way. The company still seems to be growing and expanding while celebrating its 25th year. 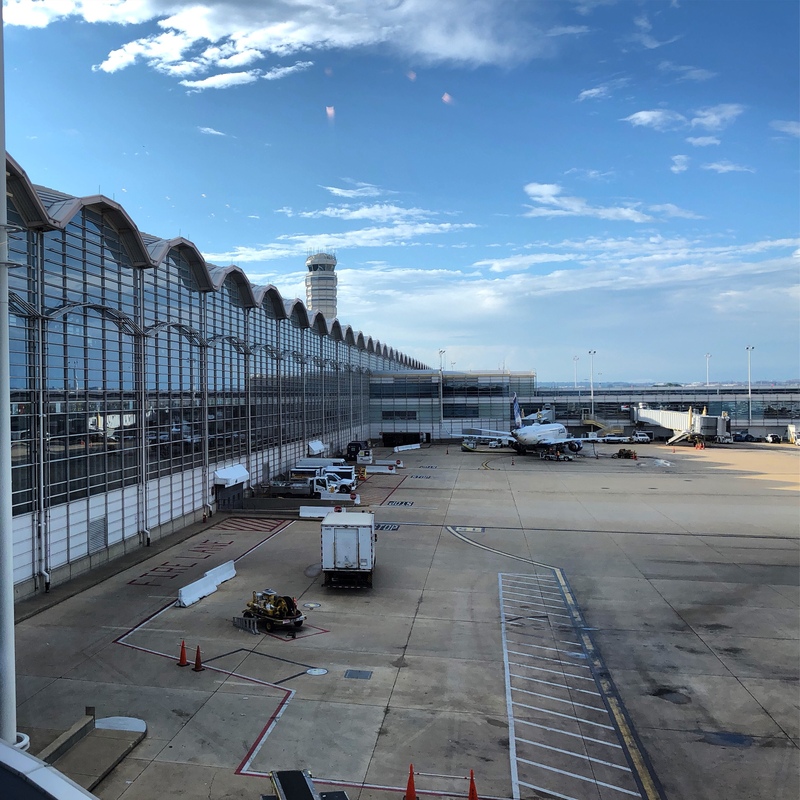 The Ronald Reagan Washington National Airport (DCA) isn’t a particularly big airport but is quite busy with many business travelers choosing it because of its proximity to the capitol and the nearby government contractor buildings. The airport itself has a few airline specific lounges including American, Delta, and United. As well as a few food options, there isn’t many options when it comes to food. But, if you happen to be in gate 10-22 area there’s a Priority Pass lounge, well actually restaurant, for you to enjoy. This perk is filed under a food credit, Priority Pass has been aggressively expanding their food options in places where they may not be able to offer a lounge option. The perk is a $28 food credit for up to four people on one Priority Pass card. One a side note: I tried visiting twice, the first time I visited I was told there was going to be an hour-and-a-half wait for food due to low staffing. This was not quite the case when I finally was able to visit but the wait was still around 20 minutes for food. Seating was plentiful with the choice between tables and a bar area. The footprint of the restaurant spanned the length of a gate area and while you could choose the busier half, you could venture a bit further to a quieter part if you wanted to enjoy some food while also getting peace and quite. I ended up choosing a table in the quite part so that I could get some work done before my flight. Their menu had a variety of options that even the most pickiest of eaters could choose from. Options included seafood, american, salads, soups, and more. 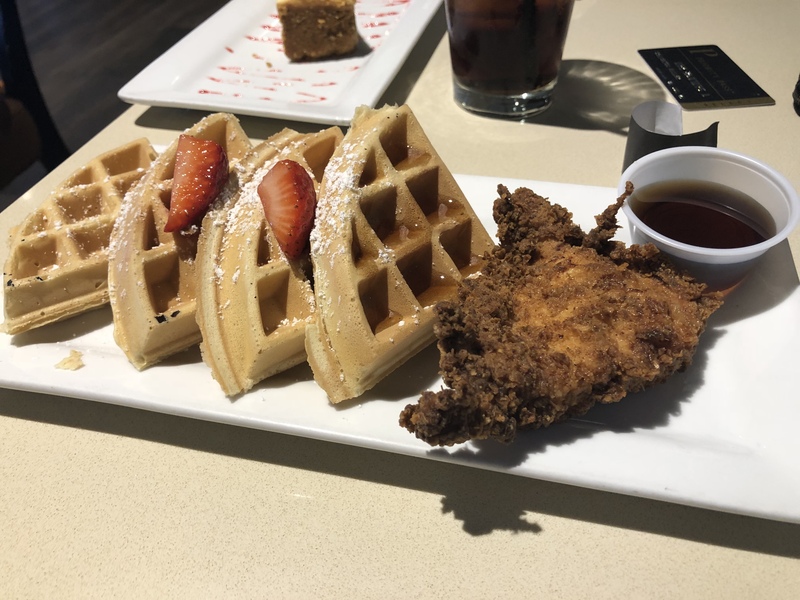 Their signature dishes seems to be their wings, which give you a large variety of sauces, and the chicken and waffles. Along with food there was a large variety of drinks that included a full beer and wine list, including specialty drinks and hard liquor. It was around 2PM when I ordered my food, choosing the chicken and waffles, but I didn’t receive it until a full half an hour later. If you’re tight on time this didn’t seem to be the best place to visit. The chicken was heavy on the batter and didn’t create an exceptionally crispy crust but the chicken was juicy and cooked well. Along with a nice fluffy waffle, pre-cut into quarters, it was a good meal overall. The portion of chicken seemed a bit on the light side but for a meal at the airport where you’re probably already stretched for time it was a good size. The surprise was that it came with a nice slice of cheesecake as a desert. It was light and creamy with a hint of vanilla. Again the portion of cheesecake on the smaller size but good for a quick bite before a flight. Wireless internet was not available directly from the restaurant, but DCA does offer free internet access that is easily connectable from where you’re sitting. At the time I tried to use it I couldn’t even stream a low-quality YouTube video. But it was fast enough for internet browsing and email work. I quite like that Priority Pass is adding restaurants to their network. It makes them more dynamic and allows them to emerge into airports they may not have been able to move into. I generally consider restaurant options to be better than lounges when it comes to food. This was definitely the case here, the variety and quality of the food was much better then you can get at a lounge at the airport and I would visit again, but only if it wasn’t very crowded and I wanted more of a bite to eat while waiting for my flight. While I probably wouldn’t get the chicken and waffles again just for the size of the portion, there were other options I would consider including their wings, burger, and the steak. I generally consider restaurant options to be better than lounges when it comes to food. This was definitely the case here, the variety and quality of the food was much better then you can get at a lounge at the airport and I would visit again, but only if it wasn't very crowded and I wanted more of a bite to eat while waiting for my flight.